The European Association for the Study of Diabetes (EASD) was founded 50 years ago, in 1965, on the occasion of its first Annual Meeting in Montecatini Terme, Italy, and this was preceded by discussions between European diabetologists who wanted to create an academic association in Europe dedicated to diabetes research, together with a related scientific journal. The driving force behind the idea was Albert Renold, from Geneva, Switzerland, who had trained with the eminent diabetologist Elliott P. Joslin, in Boston, USA, and who in the mid-1950s was the first full-time director of the Joslin Research Laboratory. Another major influence on the formation of the EASD was Karl Oberdisse (Düsseldorf, Germany), who was particularly enthusiastic about creating a European scientific journal for diabetology. In October 1962 Oberdisse organised a conference of the German Insulin Committee in Düsseldorf, inviting 53 participants from five countries. Renold was also invited. In his opening speech, Oberdisse mentioned that he would like to discuss the formation of a European diabetes association and, as an official organ of this association, a European scientific journal for diabetology . The establishment of a European society was also discussed at a symposium in Geneva, chaired by Eric Martin (Geneva, Switzerland) in 1963, after Renold had returned from Boston. During this meeting the decision was taken to create a steering committee to set up the EASD. The group met during the 5th International Diabetes Foundation congress, held in Toronto, Canada, in 1964. The meeting was chaired by Joseph P. Hoet, and 66 participants from 11 countries attended. Renold was appointed as secretary and Oberdisse was asked to proceed with negotiations with publishers for the journal, Diabetologia. To clearly express the focus on research, it was agreed to name the association the European Association for the Study of Diabetes. The first meeting of the Association took place in Montecatini Terme, from 20 to 22 April 1965. Despite some problems, such as physicians from Ernst Pfeiffer’s group from Ulm, Germany, having a run-in with the police because they were camping on a public green, Pierre Lefèbvre and his wife having a car accident on the way, and the unusual cold and rain, this first meeting of the EASD was very successful. There were 131 submitted abstracts, and 48 were selected for presentation (in English, German or French). On the evening of the 20th of April the steering committee convened to draw up a plan for the organisation of the association. The next morning the General Assembly adopted the bylaws and nominated members of the Council and the Executive Committee. And so it was that the EASD was set up as a non-profit association under Swiss law. Since 1988, the administration of the EASD has been located in Düsseldorf and established as a non-profit association controlled by the German Inland Revenue. The founders of the EASD strongly believed that an association of individual scientists would be preferable to a federation of national societies. In particular, because Europe was divided by the Iron Curtain, a federation of national societies would have been hard to administer without politics being involved. But alas, one cannot escape politics: the 1974 meeting that was planned to be held in Athens had to be moved at very short notice to Jerusalem as the political situation in Greece, which was under a military dictatorship, was unacceptable. In 1991 there was more political trouble in the form of a state telegram from the government of the then recently created country of Croatia to the EASD President, P. Lefèbvre, asking the Association not to accept any delegates from Serbia at the Annual Meeting. Thanks to the bylaws of the Association, Lefèbvre quashed this request by stating that the Association welcomed all bona fide researchers and that there were no national representatives. From the beginning, the EASD supported researchers from the former Eastern Bloc and helped them to attend the Annual Meetings. It was a matter of honour for many members of the Association in communist countries to pay their membership fee into an account in East Berlin. It was an unexpected surprise when, following the fall of the German Democratic Republic in 1991, the EASD account in Düsseldorf received 6,897.63 DM from the East German Foreign Trade Bank, converting the East German Mark to the Deutsche Mark at a ratio of 1:1. In 50 years, attendance at the EASD Annual Meetings has increased from a few hundred to over 17,000, and the number of presentations from 48 to 1,332. For many years all the abstracts submitted were scored by only five reviewers. In 1990, specific subgroups were created and nowadays the abstracts are anonymously scored by eight groups of five researchers. The poster sessions now occur throughout the meeting, and specific poster discussions with a chairperson have been instigated. Since 2004 microphones and headphones have been used in these discussions, a system that has been copied by other conferences. At the 2014 Annual Meeting in Vienna, 261 oral presentations and 1,068 posters were presented, in addition to numerous debates and symposia. All presenters were asked to make their presentations available online at the EASD Virtual Meeting. The number of participants at the EASD Virtual Meeting is doubling every year, and in 2014 exceeded 100,000 visitors from all over the world. The list of outstanding presentations from the EASD Annual Meetings is a long one. Here are just a few clinical examples: in Geneva in 1977, John C. Pickup presented the first results on the use of subcutaneous insulin pumps and at the same meeting Rudolf Flückiger gave a presentation on HbA1c as a reliable indicator of diabetes control. Gerd R. E. Meyer-Schwickerath, who introduced light coagulation as a therapy for diabetic retinopathy, gave his Claude Bernard Lecture in 1981. Eva M. Kohner presented the results of the controlled study on the efficacy of this therapy at the EASD Annual Meeting in Budapest in 1982. However, the greatest highlight of all Meetings to date is the presentation of the findings of the UK Prospective Diabetes Study (UKPDS) by Robert Turner and his collaborators in Barcelona in 1998. It was the largest general session of any medical congress worldwide. For over 4 hours, around 8,000 physicians listened to the presentation. A recent evaluation of the scientific impact of the Annual Meeting of the Association, in terms of the fate of abstracts selected for the EASD meetings, revealed that the publication rate is similar to or higher than other conferences in Europe . Since 1966, the Association has awarded the Minkowski Prize to a young scientist. The first winner was Philip Randle, who later became president of the Association. The Claude Bernard Lectureship recognises outstanding contributions in the field of diabetes mellitus. The first two prize winners, Christian de Duve (1969) and Earl W. Sutherland (1970), were awarded the Nobel Prize in 1974 and 1971, respectively. The Camillo Golgi Prize was introduced in 1986 to recognise an outstanding contribution to the understanding of diabetic complications, and the first recipient was Giancarlo Viberti. Since 2007, the EASD has awarded the Albert Renold Prize for outstanding achievements in research on the islets of Langerhans. The list of recipients is a Who’s who of international islet research, with the most recent prize awarded to Steven E. Kahn from Seattle, USA. In 2005 the Association presented the Rising Star Awards for the first time. These awards are given to researchers below the age of 38 and aim to encourage outstanding investigators to follow diabetology as a research path. Recently, this award has been accompanied by a research grant. Of the four researchers to receive the award in 2005, two have gone on to be awarded the Minkowski Prize. In order to help young scientists to gain knowledge in other departments, the EASD awards research travel fellowships. Numerous young scientists have been supported by these fellowships, and most applications are successful. In 1971, the EASD organised its first postgraduate course. Under the successive leadership of Jean-Philippe Assal, Michael Berger, Andrew J. M. Boulton, Cees Tack and now Leszek Czupryniak, the EASD postgraduate courses have taken place in numerous countries, not only in Eastern Europe but also in developing areas, like Kathmandu and Addis Ababa. The EASD currently has 18 study groups. 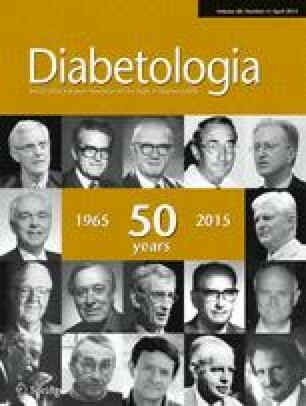 The first study group was the Diabetes Epidemiology Study Group, founded in 1966. The group had the unique experience of holding the first meeting in both East Berlin on 5 December and West Berlin on 6 December 1966. The Diabetes Education Study Group was founded during the EASD Annual Meeting in Geneva in 1977. J.-Ph. Assal, with the assistance of M. Berger, managed to motivate a whole generation of young diabetologists in Europe to integrate patient education into diabetes care. The principle of educating people with diabetes, enabling them to take care of their own glucose measurements and adjusting their treatment by themselves, is the greatest success of clinical diabetology over the past 50 years and has played a major part in normalising life expectancy in many countries. Under the leadership of Michael Berger, Jørn Nerup and Philippe A. Halban, the EASD created the European Foundation for the Study of Diabetes (EFSD). Despite the substantial advances and numerous discoveries within the field of diabetes, the pathogenesis of most forms of diabetes is still a mystery. It is the dream of diabetes researchers to fully understand diabetes, to discover its causal treatment and to provide effective prevention. The EFSD provides funding to further support these aims. The EFSD has been very successful at raising funds: thanks to generous donations by industry and other charities, approximately EUR 100,000,000 has been collected to date to support European diabetes research. The EASD collaborates closely with our transatlantic colleagues, the ADA. Both associations agreed that major statements would preferably be a joint effort. This collaboration started with a joint statement on the so-called metabolic syndrome  and was followed by statements on blood glucose lowering treatment  and more recently a statement on insulin pumps . For decades there was a consensus among the leadership of the EASD not to publish any guidelines and to leave the debate of controversial issues to the Annual Meetings and the journal. However, since opinion pieces made by certain members of the EASD were incorrectly perceived as being the official standpoint of the organisation, the EASD decided to create a policy on endorsing statements and therefore introduced the Panel for Overseeing Guidelines and Statements, which evaluates requests for such statements and advises the Executive Committee concerning any endorsement. Many years ago the EASD strictly refused to be involved in EU politics, at any level, since the ‘Europe’ of ‘EASD’ included all European scientists, not only those in the small European Union, as it was in the beginning. Nowadays, very important issues concerning research funding and diabetes care are decided in Brussels. Therefore, in 2014, the EASD decided to open a Brussels office and is guided by an EASD/EU liaison officer. The EASD is also endorsed to advise the European Medicines Agency in London. In the first 5 years the secretariat of the EASD consisted of a part-time secretary in the office of A. Renold. From 1970–1988 administration at the EASD, embedded in the offices of the British Diabetic Association in London, was carried out by James (Jim) G. Jackson . When Jackson retired in 1988, Viktor Jörgens was appointed as Executive Director as a part-time position alongside his clinical duties. The office moved to Düsseldorf, where it was run for several years by only two secretaries, Karen Page and Regina Sautter. The EASD took over most of the organisation of the Annual Meetings in 2002, and as the meeting has grown, it has become necessary for the team to grow in parallel and the Association now employs an international team of some 20 people and the position of the Executive Director became a full time post in 2002. Today, the EASD is part of the family of renowned European academic societies representing their area of research at a European and international level. These societies are grouped under the banner of the European BioMed Alliance, which was co-founded by the EASD, and a previous president of the EASD, Ulf Smith, served as the first Chair of this important representation of European medical research. There is competition between academic societies and this competition fulfils a dream that was expressed by the great physician Apollinaire Bouchardat who wrote in 1881 ‘at a time which may not be as distant as we believe, Europe will form one big republic and the only rivalry among the states will consist of the struggle to develop and to perfect agriculture, trade, science, art and literature’ . The EASD looks forward to many more years of serving as the moderator for this competition in European diabetes research. Thanks to Brian Carey (EASD) for linguistic assistance.